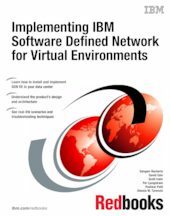 This IBM® Redbooks® publication shows how to integrate IBM Software Defined Network for Virtual Environments (IBM SDN VE) seamlessly within a new or existing data center. This book is aimed at pre- and post-sales support, targeting network administrators and other technical professionals that want to get an overview of this new and exciting technology, and see how it fits into the overall vision of a truly Software Defined Environment. It shows you all of the steps that are required to design, install, maintain, and troubleshoot the IBM SDN VE product. It also highlights specific, real-world examples that showcase the power and flexibility that IBM SDN VE has over traditional solutions with a legacy network infrastructure that is applied to virtual systems. This book assumes that you have a general familiarity with networking and virtualization. It does not assume an in-depth understanding of KVM or VMware. It is written for administrators who want to get a quick start with IBM SDN VE in their respective virtualized infrastructure, and to get some virtual machines up and running by using the rich features of the product in a short amount of time (days, not week, or months).